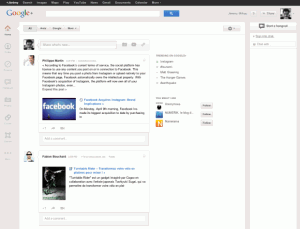 A newly redesigned Google+ User Interface is rolling out to users everywhere. Google’s aim is to makes the social network a simpler, more beautiful one. The buttons that were fixated on the top of the screen are gone and have been replaced by a customizable ribbon on the left hand side of the screen.The stream now features a much larger media content area emphasizing photos and videos (hmm sounds like another social network we know) and streams are now organized into cards for easier viewing. The new interface has a vertical navigation bar that lets you reorder and hide apps. When you mouse over an app, Google+ shows a list of quick actions, making it easier to add third-party apps in the future. An activity drawer has been added that highlights the community around your content. 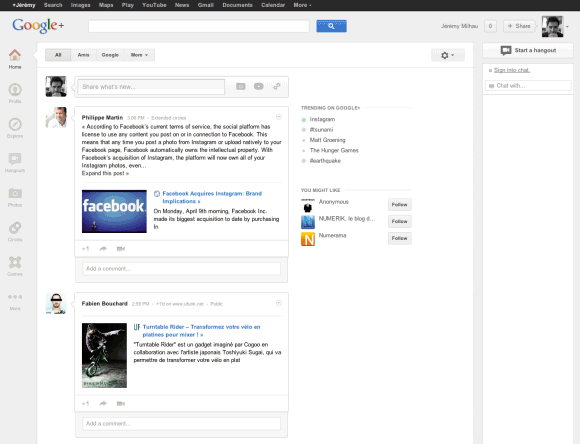 Images of the newly-redesigned Google+ as well as videos available on Google’s Blog.